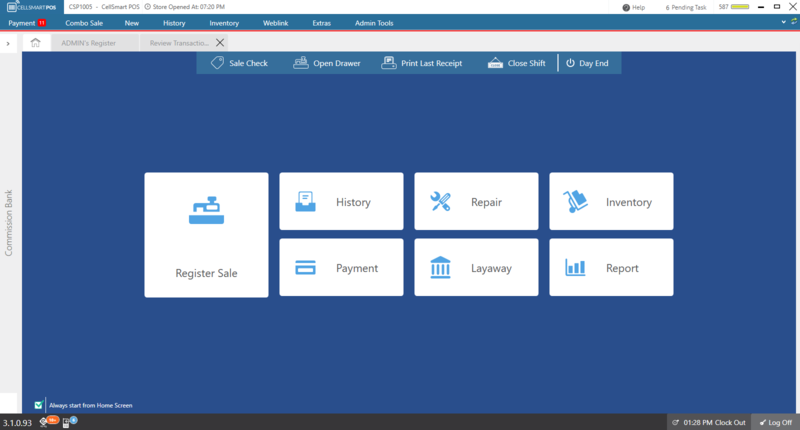 The home screen is designed to simplify the software by providing you with easy access to commonly used modules of the software. 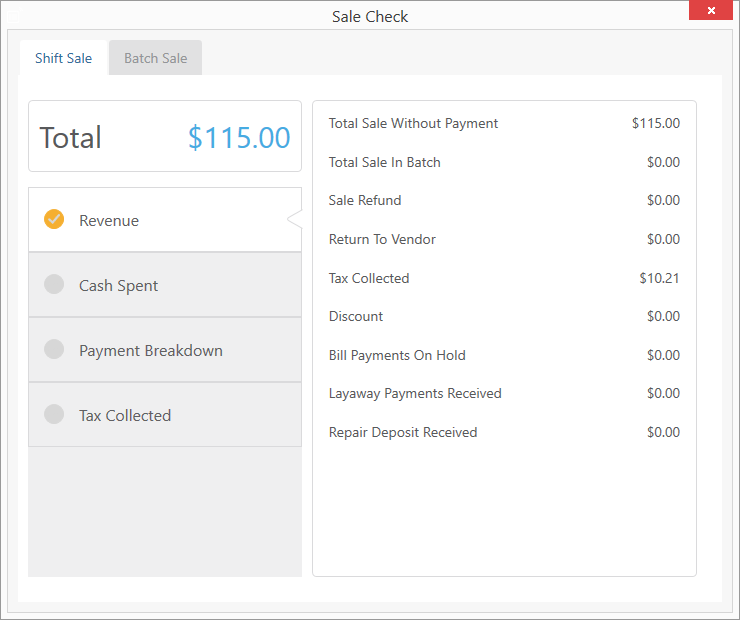 Right click anywhere on the screen to open quick links or click on the Sales check option from the Home Screen. Click on the Open drawer option from the Home screen or Right click anywhere on the screen to access quick links. Click on the Print Last receipt option from the home screen or Right click anywhere to access quick links. Then Click on the close shift icon . Do your cash count for the day. Under leaving cash, type the amount of cash you will take out of the register. Once your manual count is equal to the system count and you are good to go, click on close register. The Day end quick link allows you to perform a batch out. Performing a batch out is required before you close your store and open it the next day. The day end makes sure all shifts are closed and all employees are clocked out and it provides you with a detailed sales summary of the day. Click on the Day end option from the home screen or right click anywhere and click on the Day end quick link. Close all open shifts by selecting each shift and clicking on the register close option. Select the user and enter the user password. Enter the manual count by counting the money you have in the register excluding the starting cash. If you cash is not over or short, the software will tell you that you're good to go!, if you're short or over that software will notify you and the short or over amount will be shown in the Variance field. The money you counted will be shown in the bottom right corner of the window. Once you're done performing a cash count, you may click on the Close Register button. The shift details will be printed and the register will be closed. Once you're done closing all the open registers, you may click on the Day End button at the lower button of the window. The batch report details will be printed out and the batch will be closed. The History quick link provides you with the history of each activity performed in the software. A history of sales, repair tickets, Layaway tickets, quotes, Inventory and much more. Click on the History quick link from the Home Screen or right click and click on the History quick link. Select the from the options provided in the history window. The history module of the option selected will be presented. Click on the Repair icon from the Home screen. Click on the New Repair option. Click here for more details on creating a repair. The Inventory quick link provides you with a variety of options. You can add inventory, manage products, and see the history of your inventory. Click on the Inventory option from the Home screen. Select from the options provided in the inventory window. The selected module of the option selected will be presented. The Payment quick link provides you with all the options that are necessary for making a payment. You can make an Epay integration payment, a basic payment and view a list of the payments made. Click here for more details on E-pay integration payment. Click here for more details on a basic payment. Click on the Layaway option from the Home screen. Click on the Reports options from the Home screen. Once the report centre is opened, you may select from the list of reports to generate a report.